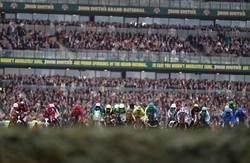 I LOVE the Grand National it's simply the most exciting horse race going. Unfortunately there are so many runners and riders that picking the winner is a bit of a crap shoot. Yes it could be the favourite, but equally you could see a 100/1 shot romping home against the odds. As you can see on my blog, I've mugged a couple of horses (they're not tips by any means, they were selected by my girlfriend on the basis of the colour of their silks! ), but there are plenty of value betting opportunities out there as well through enhanced places, odds, boosts and moneyback specials. As these markets change rapidly you need a decent list to get started and a bit of luck as well! A good place to start then is this extensive list of value bets on the Grand National at The Gambling Times. If all these offers can help you turn a profit then maybe you should just leave the betting to other people!